Ok, this is my third Hola Fruta review and I'm enjoying it thoroughly. I'm down a little bit further in the container so I keep hitting tasty strawberry (fresa) chunks. 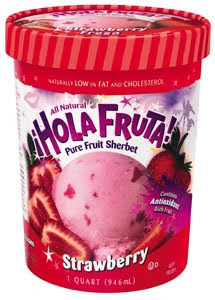 MMMMMM, oh I'm addicted to Hola Fruta, it's gotta be the best sherbet out there. Tastes like frozen strawberries and fresh strawberries at the same time, and in a good way. Do what I do, wait til it's on sale, then try a new flavor! MMMM, oh I want more now. Nice blog! This looks YUMMY!! Great stuff! My local store only has the pomegranate and blueberry flavor, so I'd really like to try the others. If they only stock the one flavor though, I'll still continue buying it.